While the College decided in April to maintain its current enrollment size, attention has shifted to addressing the issue of housing. With some students yet to find housing for the upcoming term, the construction of additional dorms on campus may be the solution. Related to the housing shortage on campus is equal housing opportunities. With the College’s recent introduction of the House System in the fall of 2016, students are no longer eligible to participate in Room Draw for all buildings on campus. Dorms and roommates are restricted by Housing Communities — which include Allen House, East Wheelock, North Park, School House, South House and West House. Students have noticed the disparity between the quality of dorms between different Housing Communities. The infamous dormitory, known as The Lodge, was built in 1961 to act as overflow or budget accommodation for the Hanover Inn. By 1974, it was repurposed for student housing and in 1993 it was renovated. New Hampshire and Topliff Halls are the other dormitories that are a part of South House. New Hampshire Hall, built in 1908, was used as a barracks in 1918 for World War I and operated as one of ten Navy V-12 dormitories during World War II. It was remodeled between 1928 and 1930 and again in 1986 to add a one-story kitchen extension to the rear. Topliff Hall was subsequently constructed in 1920. In 1958, the dorm was renovated to increase the number of single rooms from 50 to 122. Like New Hampshire Hall, it was remodeled in 1986 to add a kitchen. Unlike the older dorms of South House, most of the East Wheelock cluster, originally comprised of Andres, Morton, and Zimmerman Halls, was erected between 1985 and 1987. In the summer of 2000, McCulloch Hall joined the existing dorms to complete the cluster. As the first dorm built after the passage of the Americans with Disabilities Act of 1990, the hall was the first to have a built-in elevator. The four dorms included in the East Wheelock Cluster connect to an underground common area known as Brace Commons. The shared space includes its own snack bar, an amenity unique to the East Wheelock House. One housing option that does not fall under the Housing Communities is the McLaughin Cluster, the College’s most recent addition. Built between 2004 and 2006, the cluster is made up of six dorms and only houses Living Learning Communities. Many students refer to the cluster as “Hotel McLaughlin” for its large rooms and impressive common spaces, such as Occom Commons. According to Hanover director of planning, zoning and codes Robert Houseman, the McLaughlin Cluster’s construction caused worries from Hanover residents that are typically seen with College building projects, such as changing the town’s character, increasing traffic or noise, and a loss of green space. Hanover town manager Julia Griffin explained that there is concern among residents when the College’s construction plans may affect their residential property. While students adjust to recent changes such as the House System, they have time to prepare for the addition of new dorms on campus. There have been no significant steps made in the administration’s plans to build more housing, according to Houseman. “The College is working on evaluating various locations for dorms,” Houseman said. “But we don’t have anything in the works that we’ve reviewed or even begun discussing with the school. 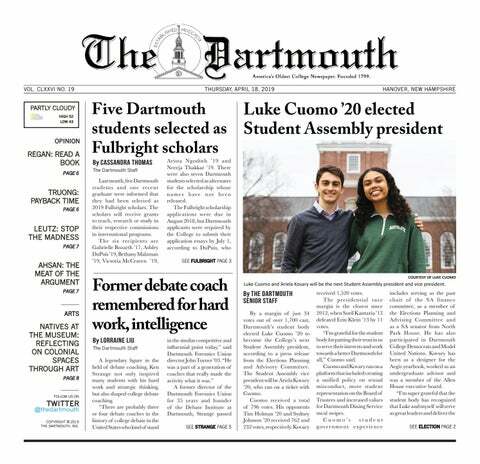 Dartmouth’s close collaboration with Hanover is an indicator of the strong relationship the College has with the town. The College works alongside the town on several topics, ranging from its infrastructure to sustainability, according to Hanover town manager Julia Griffin. Griffin emphasized the town’s support of Dartmouth’s desire to build more student residences. With more undergraduate students living off campus, graduate students are pushed further away from Hanover. In addition, there is a concern for the “deteriorating quality of privately owned housing for undergraduates” due to poor maintenance, according to Griffin. The inadequately maintained homes negatively impact neighborhoods, reducing the amount of housing available to faculty, staff and graduate students.